There are days that all I fancy doing is nothing and today is one of those days, but at the end I ended up working a lot, where do time goes??? As I am writing this recipe is almost time to pick up my little ones from school and I still haven’t finish my work, uff! I could do with a bit more time for myself to do all the things I need to do. Anyway, because my morning literally went so quickly, I was thinking of what to have for lunch (I was starving hungry!!!) but I didn’t want to spent too much time in the kitchen, so I thought about cooking this super mega delicious cream soup using some of my poblano rajas I made yesterday and what a great idea! I had lunch really quick! Honestly! It was super mega fast! I love these soups, my dad used to make a carrot cream soup to die for and ai guessed that it is because of him that I started to love them and now it is one of my comfort food dishes of all times! I use almost any vegetable and listo! I have a soup in no time! Here is the lovely recipe! Enjoy and I hope you have a lovely weekend! Heat the oil in a large saucepan and add the onion. Fry for 3 min and add the rajas and coriander. After frying the rajas for 3 min, add the flour, butter. Mix well for 2 min so the flour cooks and add the milk. Mix and put everything in a blender. Blend until getting a smooth consistency and pour it back into the saucepan. Add salt and pepper and mix until the soup thickens. Once the soup has thickened add the sweetcorn (leave some behind for decoration) and cook for 2 min. 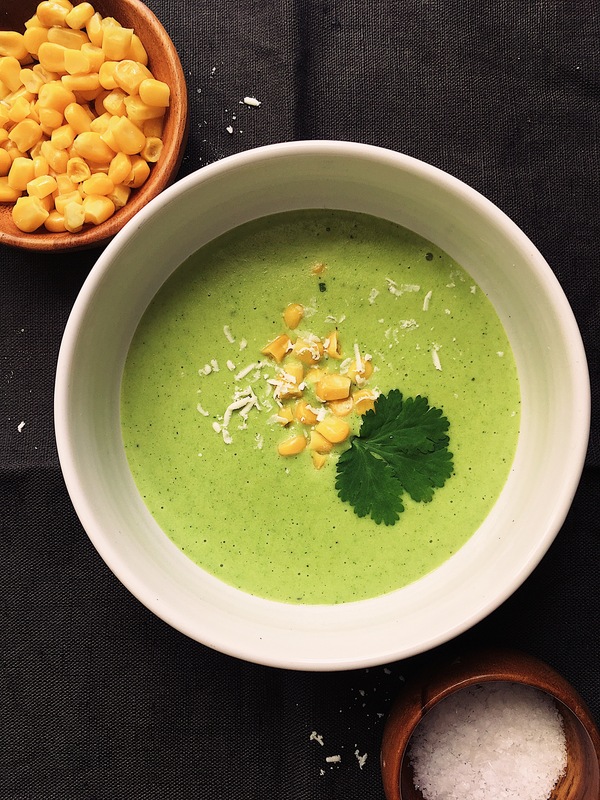 Serve in a bowl, add more sweetcorn for decoration and flavour and finish the soup with some delicious grated Cotija cheese. Enjoy!